What Societal Class Are You In? 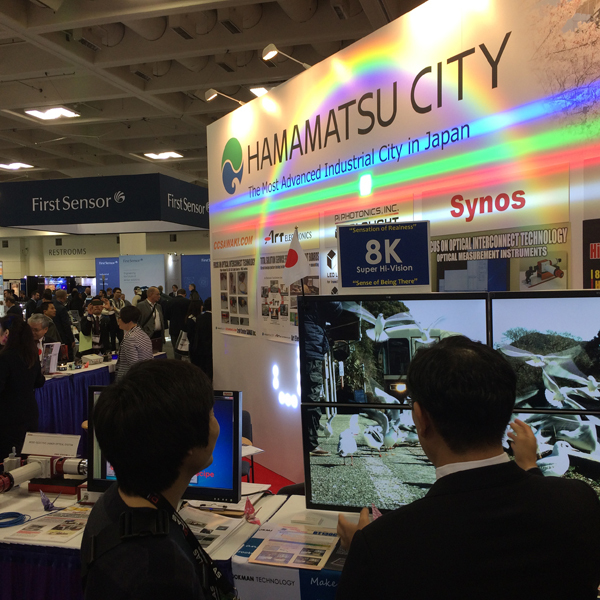 Last week, along with my company which is working on a lens technology that has real game-changing potential in the imaging space, I headed to the SPIE Photonics show in San Francisco to meet vendors, look for investment opportunities and possible R&D partners. It was at the previous SPIE show in San Diego where we finally found our ideal contractor to build our initial proof of concept prototype. They are a world-class lens design crew who we intend to work with for years to come. To my point: I love shows like SPIE because in a matter of hours you can meet with dozens of companies and their leadership and get a quick sense of their level of commitment, passion, and professionalism. At such a high-calibre show like SPIE Photonics West, professionalism and presentation are taken to new levels; and as a result, poorly prepared companies stand out like a sore thumb; likewise the good ones. The United Nations named 2015 the ‘International Year of Light’ for a reason. Light impacts every facet of our lives. And light-based technologies, also known as photonics, are in every piece of technology you probably own or use at work. Many countries, including mine, view light-based technologies as strategic economic assets given their broad applications. I don’t know about you, but as an investor that kind of widespread impact excites the hell out of me. 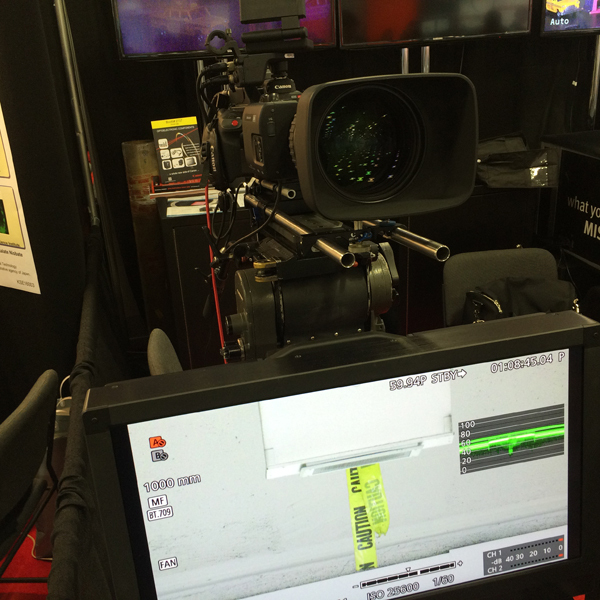 The possibilities are virtually endless for certain lens hardware and imaging software if engineered for scale. 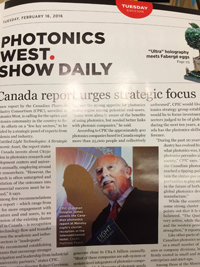 Just looking at a small nation such as Canada, it was reported by SPIE’s Mike Hatcher that there are roughly 400 photonics companies based in the nation that employ more than 25,000 people; and “collectively generate close to $4.6 billion annually.” However, Canadian “imports of photonic goods reached C$6.4 billion in 2015…” This clearly indicates that even in a small market such as Canada, there is more demand from domestic end-users than production. A small Japanese tech company shows off its revolutionary 8K chip. If you’re an angel or VC, or just an entrepreneur looking for opportunities, SPIE Photonics is the place to be. Unlike CES, which our technical team attended last month, SPIE has true world-changing technology on display in all stages of development. From Canon’s new lens system that’s worth more than some houses (the magnification power on this camera lens is insane!) and its 250 mega pixel sensor prototype, to defense contractors demonstrating their state-of-the-art surveillance equipment, a Fortune 500 company enabling toothpick thin surgical tools with a built-in camera, and a startup from Japan revealing the very first 8k chip, SPIE attracts the world’s top innovators and entrepreneurs for a week of awe-inspiring technological demonstrations. CES, on the other hand, had about 100 different drone companies and dozens of VR startups hoping to grab consumers’ attention with a different gimmick or gadget that was only slightly different from the last. While CES may draw in about 5 times the audience, SPIE attracted 20,000 strong of industry leaders and innovators looking to get deals done and make an impact on the world through the advancement in light… inspiring stuff. I took a great course on the second day at SPIE. It was taught by Kevin Harding, a member of GE Global Research. He is a 30-year veteran in the optics industry having worked on massive optical projects in interferometry and metrology. His course was awesome. About 20 people attended and Kevin made it very interactive. He also stuck around afterward, taking one-on-one questions – best $200 spent in a while. Light-based technologies enrich our lives more than ever before. For that reason, along with the calibre of attendees, SPIE is the show for serious tech investors. Unlike many of the gimmicks and trinketry on display at CES, optics are driving most of today’s game-changing tech trends. And they’re all on display at SPIE Photonics. P.S. Subscribe to my newsletter below and receive critical insight on new investment trends in the tech sector and much more. Only my best content will land in your inbox.